Although we are already feeling very adjusted into 2018, at Orian we feel spring is the best time of year to put the spotlight on healthy, fresh ingredients. Flowers are blooming and the longer days mean we are spending far more time outside, where we can appreciate a greener environment and enjoy the fruits of our labour! 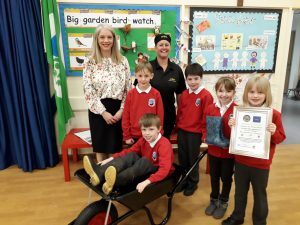 With this in mind, a few months ago, we ran a competition across our primary schools to win a wheelbarrow full of gardening goodies and our winners have just been announced! Congratulations to Grange C of E Primary, Greystoke Primary and Richmond Hill Primary! 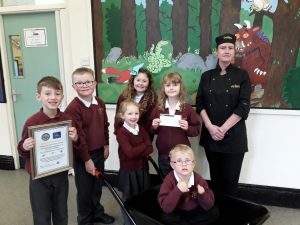 This week, each winner received their own wheelbarrow and a cheque for £100 to fill it full of tools, seeds, plants and whatever else they feel would benefit their outdoor spaces. 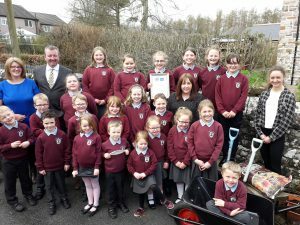 We hope their prizes ensure pupils understand the benefits of growing their own ingredients and nurturing tiny seeds into beautiful plants to enjoy. We’ll be checking back in with our schools in a couple of months so watch this space for updates. Grange C of E Primary: Ready and waiting with wellies on! Orian approach every new venture with a ‘fresh is best’ mindset. This motto is extremely prevalent in the new Harraby Café, located in Harraby Community Centre, Carlisle. Orian have just launched their service inside the Café and plenty of exciting changes are set to take place over the coming weeks, leading up to an exciting launch to celebrate the café’s completion. 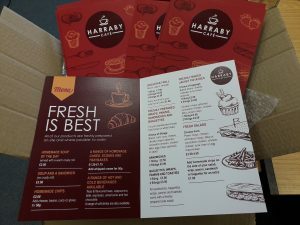 If you are a local looking for an expertly-made fresh cappuccino or a healthy salad made to-order, look no further. Not only are we offering customers a revived menu, our cleaning team have also been working hard to make the area gleaming for customers – starting with the café floor. Our primary aim is to ensure customers receive only the best service and quality and we believe this simply wouldn’t be possible without fresh ingredients and inviting surroundings. Here’s to spring and embracing all things bright, blossoming and bountiful.